Every generation thinks they invented love and romance, isn’t that what they say? And though people today might grumble that it is a holiday invented by sellers of cards and roses, historians actually follow the roots of Valentine’s Day all the way back to the Roman Festival of Lupercalia, which honored the goddess Juno, patron of women and marriage. But the day is officially named after poor Saint Valentine, who was put to death for defying Emperor Claudius and his cancellation of all marriage promises in Rome. Recruitment for the emperor’s several wars, none of which were going well, had fallen away. Men did not want to leave their wives and families, so Claudius thought he’d do away with any new ones. Valentine defied the decree and performed secret marriage ceremonies, a romantic service for which he was beaten, killed and eventually sainted. Saint Valentine was much celebrated in the Middle Ages, the age of courtly and chivalrous love. Common folk believed that birds began their mating in mid February, which added to the romantic traditions. Shakespeare mentions the English tradition that a girl would marry the first man they glimpsed on Valentine’s Day within the year. 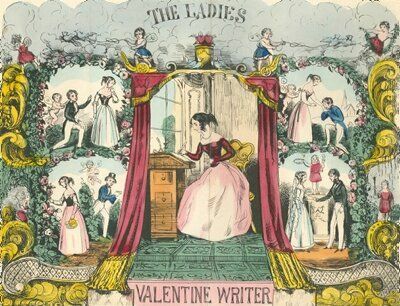 There were special Valentine papers printed in the Regency, but without the chance to purchase a card as we know it, the ladies and gentleman often had to put on their creative hats and come up with their own verses and vows of love. Who wouldn’t like receiving a Valentine like that!? But if rhymes and couplets were not a strong suit, would-be lovers could get a little help with one of the Valentine Writers published each year. These specially produced little pamphlets were an annual custom and contained many different kinds of poems and verse crafted for all sorts of Valentines. They went by such appealing titles as True Lover’s Note Book, Every Lady’s Own Valentine Writer,and The Bower of Cupid. 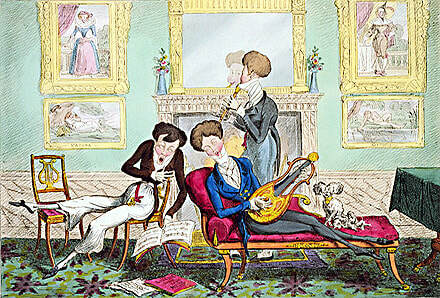 They provided seriously romantic verses and sonnets, witty poems and amorous messages. A love-sick swain could page through, find the perfect sentiment and add it to his Valentine masterpiece.